Are your ceramic knives dull? Learn how to sharpen a ceramic knife. If you’re reading this article, it’s highly likely that you own a ceramic knife set and have now discovered that even the best ceramic knives can, and do, become dull. Ceramic knives are highly touted as the kitchen knife that never goes dull, but those claims are far from the truth. While they hold their sharpness for a good 6 months, or even longer, depending on usage, they will eventually become dull and you’ll be left trying to figure out how to sharpen ceramic knives. Don’t worry, you’re not the only one who has dull ceramic knives hiding in their knife block. The question now is how to sharpen a ceramic knife at home. Of course you can always send the knives out to be sharpened by a professional, and that will likely produce the best and most reliable results, but it’s expensive and probably not practical for everyone. I mean, do you have a back up set of knives to use while the others are away at being sharpened? The problem with sharpening ceramic knives is that ceramic blades are very brittle. Ceramic has a hardness of 9.5 (as opposed to steel with a hardness of 6.5). If you apply too much pressure to the side of the blade, it could easily snap. Also, the only material hard enough to sharpen ceramic is diamond, with a hardness of 10. Taking these two things into consideration, you can see the battle you’re up against. If you’re already skilled at using sharpening stones for your steel knives, you’ll have an advantage over the rest of us. There are two main differences in sharpening ceramic versus steel knives that you’ll need to be aware of. One is the technique you use, and where you place your hands on the knife. Putting any pressure on the blade laterally could cause it to snap. The best way to handle the knife when sharpening on a stone is with both hands on the blade, instead of using one knife to hold the stone and one to move the knife around. You’ll have more control of the blade and the pressure you’re applying if you use one hand to hold the knife handle and one hand to move the blade along the stone. The second difference is that when you are sharpening ceramic, a burr will not form when you’ve reached the proper point on the edge. When sharpening a steel knife on a stone, you can sharpen it until you feel the burr by running your finger in the direction of the blade. Without the burr forming, it may be difficult to know when you’ve completed the task. What other ceramic knife sharpeners are there? If you’d rather not use a diamond stone to sharpen your ceramic knives, there are a few other options you can try before you give up and send them out to be sharpened professionally. You can use some electric knife sharpeners with ceramic knives. The issue becomes making sure the sharpener you plan to use can handle ceramic knives. The reason some knife sharpeners are not appropriate for use with ceramic is largely due to the abrasives used on the sharpening wheels. Lower-end sharpeners often use ceramic or tungsten carbide abrasives, which are just not sharp enough to tackle ceramic. Another thing to be aware of when shopping around for a ceramic knife sharpener is that many honing rods are billed as “ceramic knife sharpeners”, but they are not. They are honing rods made of ceramic, which again is an abrasive used to sharpen other softer metals, but cannot sharpen your ceramic knives. Don’t get confused when you see that term. You need to look for a sharpener that specifically says it can be used to sharpen ceramic knives. Here are two electric knife sharpeners that you might want to consider using to sharpener your knives at home. Of course, you need to be very careful when using any type of sharpener as you can end up causing further damage to the knife. 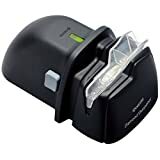 Both of these sharpeners use diamond abrasives to sharpen, and can work out the nicks and divets that ceramic knives often suffer due to their brittleness. These tools aren’t likely going to restore the blade to factory sharpness, but they will help prolong the life of the knife. Aside from the three methods we’ve laid out here (professional sharpening, sharpening with a diamond stone, and sharpening with an electric knife sharpener at home), I would probably just recommend buying a new set of knives. You’ve probably now learned that ceramic knives aren’t the easiest to care for in the kitchen, so maybe you’ll revert back to buying steel knives (we highly recommend these awesome Japanese chefs knives), or maybe you’ve come to enjoy the ceramic knives and just want to buy a new set of those. Due to the brittleness of the ceramic blade, there are specific care and maintenance issues you should be aware of to keep you knives in tip top shape. Never use a glass cutting board. Instead, always use a wooden or plastic cutting board. Never toss a knife in the sink, as this can easily chip the blade. Likewise, dropping a ceramic knife can cause considerable damage. Don’t use ceramic knives to cut through tough, thick, or frozen foods. Store them carefully. The blade shouldn’t come in contact with other utensils. It’s best to store ceramic knives in a protective sleeve. As you can see, sharpening a ceramic knife might not be the easiest thing to accomplish at home, but it’s certainly possible. If you have a ceramic kitchen knife set that you love, there’s no need to throw them out when they become dull. Just follow the tips above for sharpening a ceramic knife and you should be able to return the knife’s blade to a good degree of sharpness.